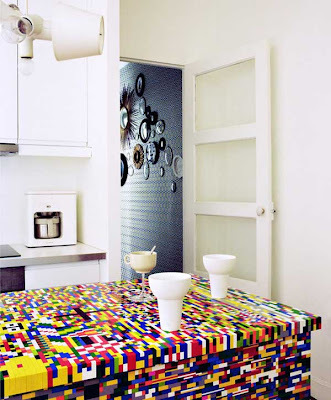 This island made of Legos is making the rounds of the design blogs this week and it's being met with near-universal heaps of praise and squeals of delight. Ugh. Ugh. Ugh. The trappings of childhood are best left behind in childhood if you ask me. This is not cute, this is not clever and this is not cool in any way. I get it, the designers are attempting to be smart and stand out from the crowd. Maybe they're trying to teach some kind of a saccharine lesson about the virtues of simple mindedness. Again I say. Ugh. Ugh. Ugh. But on a happier note, I found this story on a host of sites but in following the links back through a bunch of them I came across one of the best finds I've found in ages. A commenter who goes by the name of Clarity left a comment a couple of weeks ago and her Google profile was a dead end. I'd resigned myself to not knowing who she is. Well, in digging around about this absurd island, I came across Kitchen Clarity, commenter Clarity's blog. And oh what a blog it is. Seriously, check it out. She has fantastic taste, isn't afraid to say what's on her mind and unlike me, can express herself completely in one or two paragraphs. Astounding! Check out Kitchen Clarity and tell her I said hello. In the meantime, what do you think about this island? Is it as mortifying as I think it is, or does it have some hidden redeeming qualities I just can't see? *All images by Goluza Photo for Maison Francaise. Um, yeah, that's absurd...and unsanitary. If you want something colourful and whimsical I'm sure Caesarstone or Vetrazzo could fit you out. Making cool things out of Lego-nothing wrong with that. But not an integral part of a kitchen that is meant to be functional. I also agree awful, awful - but funny really! Ladies, I'm glad I'm not the only one. Stupid. 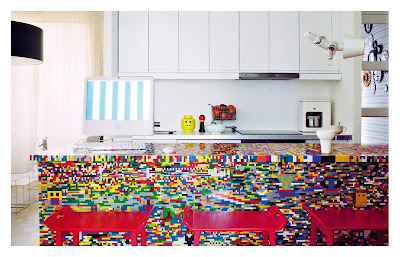 As a mom of lego enthusiasts the last thing I want to see everyday in my kitchen is more little pieces of plastic crap. It would be like giving a Big Wheel made out of carrera marble to my kids. They would be like WTF?? Stupid. Agree with Susan whole-heartedly. Not sanitary and not functional! It would melt under hot things, crumble under pressure, forget using it to slice the odd something here or there. Elizabeth: A carrera Big Wheel, that's a good one. Lili: Welcome and thanks for your comment. This kind of impractical whimsy drive me nuts. Whimsy and function tend not to work together well. The first thing I thought when I saw it is, I'M MELTING!!!!! Plastic + heat = puddle of plastic goo. Or at the least, oddly morphed plastic shapes. 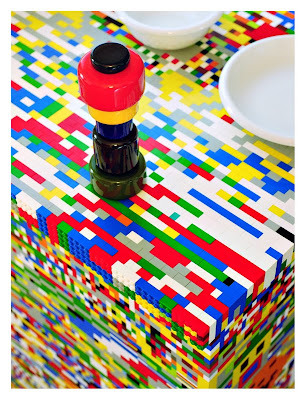 Aren't there better things to do with Lego?? Like, say, give a box or two of them to your kids and get them off the computer or away from the TV?? On the other hand, you don't have to wait 2 months for your Lego countertop to be installed, and it won't get cracked in half being loaded onto the delivery truck.... ARGH!!!! Oh Kelly, I just got your e-mail. You have my sympathies. Please write a blog post about your trials and tribulations and NAME NAMES! There is a sort of roots-of-science romance with tech guys in their 40s and 50s. Can-do attitude. Object-oriented programming. I wouldn't do it. My husband is in biotech. But I'm not above the insider gesture. I did see a limestone counter yesterday, stone imported from Turkey, embedded with many inch-long worm-looking fossils. That was cool. I would do that. My husband has a bio-tech, and we love science. And it's SUBTLE. I immediately recognized it as fossils-embedded stone, but most people don't. I guess I'm hoping the squeamish won't. All white Legos with a glass top is one thing, but what's shown here is an abomination. I love the idea of your fossilized annelids. It's the sort of thing that appeals to me endlessly and I'm not even a biologist. When calculating CFM, do you take into consideration the distance to where it is being vented. My vent is going across the garage ceiling and out he side of the house. About 34 feet. I have a 36 inch , 6 burner gas range. Kitchen/breakfast is 13x26 with a vaulted ceiling. what CFM would be best?